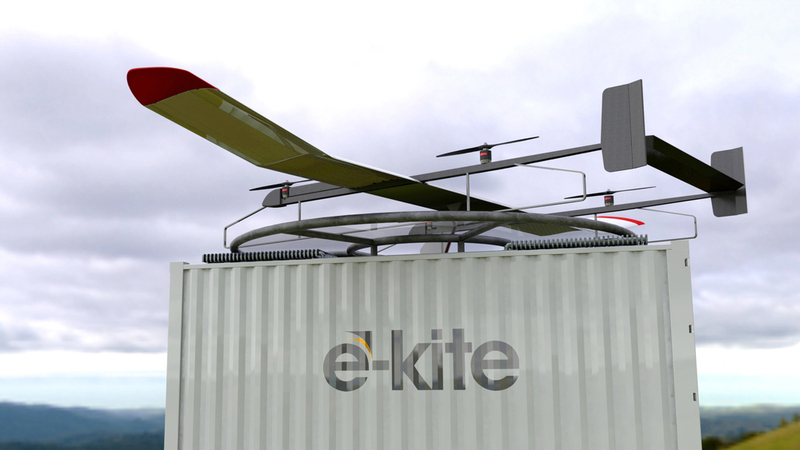 e-kite’s ambition is to be the first company in the world to commercially launch an economically viable kite power system. Our first model will be a 100kW system, which can generate electricity for about a hundred households. This e100 model is targeted at farmers, land owners, communities and companies in rural areas. Automatic operation enabled by the wing-integrated multi-copter launch and land system. Low investment costs due to the single-generator ground station set-up and low operational costs due to the long lifetime of ultra-light wings. Optimal aerodynamic performance due to the optimized wing shape and minimal cable drag losses due to the single-line concept. Friction losses are largely avoided by applying a gearless direct drive generator. Extensive safety concept with color and light markings, transponders, a wing-integrated emergency parachute and a multi-copter which can stabilize the wing if required. The ground station is built into a container to avoid people or animals getting hurt by the traction cable. The kite power system can easily be transported by truck, allowing it to be used for temporary applications and at remote sites. The e100 is designed to last at least 20 years. The container housing ensures that ground station components are shielded from weather influences. Want to know how to buy? After introducing the e100, we will scale up our technology to 500kW to undercut massive multi-MW wind turbines in generation costs. This system will be targeted at the mainstream onshore wind market with utilities and other large-scale renewable investors as customers. At 2MW, kite power technology will be able to beat fossil fuel power plants. At this scale our systems might be applied offshore, because they can float on pontoons.